Debates are raging these days on Facebook, Twitter, Reddit, and in theater foyers about what being true to Shakespeare really means. Guess what: "true" Shakespeare, this exhibit reveals, has been an evolution. "Four Centuries of Staging Shakespeare"
"I don't remember Chorus being hung at the end." He isn't. Robert Richmond added Chorus's execution in his production of Henry V at the Folger. Why? Richmond sees Chorus as Shakespeare's portrayal of Essex—I think. "Why did you cut Shylock's baptism scene?" There isn't such a scene. The man who asked this question during a talk-back session after a Shakespeare Theatre Company presentation of The Merchant of Venice was recalling such a scene added to the Public Theater's Shakespeare in the Park version starring Al Pacino. Why? Got to give Pacino his big exit, I guess. "When are Viola and Sebastian going to recognize each other?" In the last act; their other near encounters are just extraneous stage business. A teen-age girl, apparently new to the play, asked this of a friend at the intermission of the Robert Richmond (again) Folger production of Twelfth Night, which featured antic between-scene comings and goings. Why? Maybe Richmond thought Shakespeare's play wasn't funny enough or was too confusing, so he added Keystone Kops visuals, which clearly backfired for the exasperated teen-age girl, more dumbfounded by the stage business than the play. Re: Virgilia, in an intimate scene with Coriolanus urging him not to go to war. "That isn't Shakespeare's is it?" It is; but it's not in Coriolanus. It's actually the Lady Percy-Hotspur scene from Henry IV, Part One, that director Kevin Crawford inserted into his Coriolanus at the Palm Beach Shakespeare Festival. Why? To give Virgilia more lines, perhaps? Or to make his own portrayal of Coriolanus seem more noble? Beats me. "I don't remember Lady Montague killing herself. Does everybody else cut that scene?" No, the scene doesn't exist, except in the staging by Aaron Posner, director of the Romeo and Juliet currently playing at the Folger. Why? Maybe because he thought four ghosts on the upper stage are better than three. That's the best explanation I can give, and if that makes absolutely no sense to you, I can't help you. The exhibit "Here Is a Play Fitted: Four Centuries of Staging Shakespeare" is taking up residence in the Folger Library's great hall. 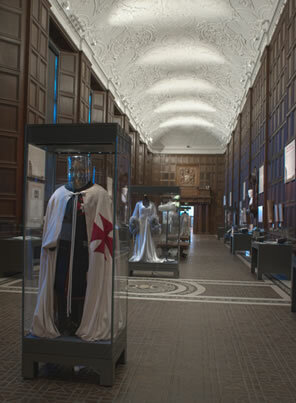 Photo by Carol Clayton, Folger Library. However, I can offer some perspective. It's notable that in the above list of stage mutilations of Shakespeare's text, three of the examples are from Folger productions. Furthermore, every Shakespeare production the Folger has mounted the past three or so years has had textual alterations beyond trims, whether it was flopping scenes, intercutting scenes, adding scenes, or revising scenes in some extratextual way. Surely, such a bastion of Shakespeare scholarship and keeper of The Bard's legacy would have more reverence for staging his works, you would think. Not when the current Lady Montague, who we see swallowing poison on stage, is played by Michele Osherow, the theater's resident dramaturg. Debates are raging these days on Facebook, Twitter, Reddit, and in theater foyers about what being true to Shakespeare really means. Guess what: "true" Shakespeare, this exhibit reveals, has been an evolution. As early as the Restoration era, Shakespeare's texts were revised and adapted, sometimes to give more weight to theater actor-managers who starred in their own productions, such as Colley Cibber at Drury Lane, whose Richard III influenced Laurence Olivier's version some 200 years later. David Garrick gained his fame—and ironically kept Shakespeare's fame burning through the 18th century—by staging wholesale rewrites of the plays, sometimes interpolating scenes from other plays, adding his own lines, and altering plots, even. In Garrick's version of Romeo and Juliet, Juliet awakes from her death sleep after Romeo has swallowed the poison, but before he dies. They share a few lines before he expires. The Victorians of the mid-19th century are responsible for academic Shakespeare on the stage. While William Charles Macready returned to the original texts, he saw staging Shakespeare as a tool for educating the masses, and he concentrated on elaborate scenery and costumes. Thus was Bard snobbery imposed on the theater-going masses. Charles Kean followed with what the Folger exhibit labels "Antiquarian Shakespeare," striving for historical accuracy in the designs and presentations. At the turn of the century, Henry Irving and Herbert Beerbohm Tree strove in England for realistic presentations in their scenery and action. Booth was touring in the United States playing condensed versions on the basis that it was impractical to act Shakespeare's plays as he wrote them. By the 1930s, Shakespeare had moved into the Modernist Movement, in which directors started using the plays to reflect contemporary social concepts and issues. This usually meant warping the plays, at least, to emphasize one concept or another. These theatrical Shakespeare evolutionary stages are still present today, as practitioners range from the purists who believe Shakespeare should be unadulterated in every way—including using Elizabethan costuming—to directors who cast the plays in thematic settings or specific points of history and have no qualms snipping, switching, adding, and altering the text to enhance either the theatrical experience or to express their own philosophies. Palm Beach's Crawford pumps up his Coriolanus much the same way Cibber spotlighted his Richard. In the recently released Carlo Carlei film version of Romeo and Juliet, scriptwriter Julian Fellowes does exactly what Garrick did, changing most lines to make them seem more contemporary, keeping a few of Shakespeare's best lines, adding scenes, altering the plot, and waking Juliet up after Romeo swallows the poison but before he dies. At the Shakespeare Tavern, Artistic Director Jeff Watkins insists on historical fidelity in costume and presentation the same way Charles Kean did. The Shakespeare Theatre Company in Washington, D.C., with its elaborately authentic sets, continues in the Irving-Tree tradition. Posner follows in the steps of the Modernist Movement. The divergent traditions are not limited to the theater, either. Random House's Hogarth Shakespeare project, which is planning to retell the plays as modern novels written by such popular writers as Anne Tyler, is not much different than Charles and Mary Lamb who retold Shakespeare's plays as children's stories in 1807. We have graphic novels of Shakespeare's plays, radio adaptations, and cinematic re-imaginings. Some day we will surely have Shakespeare video games (Assassin's Creed: Macbeth rated M for mature, or Comedy of Errors in a Super Mario kind of format). Above, David Garrick and George Anne Bellamy as Romeo and Juliet in the tomb. (1753 engraving by Benjamin Wilson). Below, Michael Goldsmith and Erin Weaver as Romeo and Juliet in the tomb (2013 photo by Teresa Wood, Folger Theatre). As for all those impassioned debates that one kind of Shakespeare is the only true kind of Shakespeare, the Folger exhibit starts its history with the implication that the first fiddling with Shakespeare's text came in Shakespeare's time by his own company, if not by him. This is indicated by comparing various printed versions of the plays. Scholarship is now trending away from the "bad" quarto theory that those printings were of pirated or memorial copy and toward a hypothesis that they were touring versions of the script. In the American Shakespeare Company's productions of Hamlet a few years ago, the actors would flip a coin right before starting the play to determine which version, the quarto or the First Folio, they would perform that night. Having played both versions over the course of the season, the actors decided that the quarto version held more theatrical resonance, though it has been the First Folio version that scholars revere as Shakespeare's intended play. And maybe it was, for Shakespeare the poet-playwright. However, Shakespeare the theater actor-manager may have realized that a more streamlined, dramatically arresting version worked best in his playhouses or for provincial audiences. Across this website, you will read that I have widely divergent reactions to the altering of Shakespeare's scripts in productions. Sometimes cutting one scene bothers me while some out-and-out mish-mashes earn my high praise. Certainly, I blasted the Carlei-Fellowes movie, and I share in the irritation of those audience comments that start off this commentary. For my personal taste, the demarcation is between those theater directors or filmmakers who offer enlightenment into what is already there in Shakespeare and those who consider themselves smarter than Shakespeare or who don't trust him and end up detracting from the plays, shifting Shakespeare's words into matter he clearly didn't intend, or confusing the audience. The bottom line, though, is that I appreciate any and all attempts to stage Shakespeare and demonstrate his ongoing relevance to our society and our selves. In all the heated debate of what is true Shakespeare and what isn't, I say chill. As the Folger exhibit demonstrates, even the adulterations have advanced Shakespeare knowledge and popularity over the centuries, and the same could happen now. If the current Romeo and Juliet film breaks box office records, all hail the effort (as of this writing, though, it was proving to be a box office dud—so let loose the debate over whether it failed because it was too Shakespearean or not Shakespearean enough). The ultimate irony in the Folger exhibit is not what's happening in its theater (which, for the most part, is well-staged, enchanting stuff—my wife and I are members and subscribers for a reason), but what's happening more and more in other theaters we've been attending. Many companies focusing on text-centric presentations are going back to the staging conditions and production processes of Shakespeare's time (with or without women in the cast). In doing so, they not only are discovering great dramatic and comic wealth in the plays but are also gleaning cost efficiencies and attracting new audiences, especially younger audiences. Despite 400 years of technological improvement, expanding intellect, wider experiences, social changes, and directors' meddling, Shakespeare's words have never been more modern or more theatrical than when they are acted in the environment he himself wrote for 400 years ago. When Ben Jonson wrote that Shakespeare was "not of an age, but for all time," he may never have realized just how true that would be.